Workers remove a victim's remains from the mine in the municipality of Amaga, Colombia. 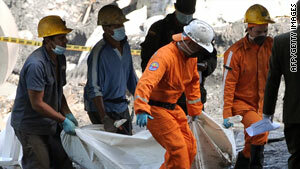 (CNN) -- The death toll in a coal mine explosion in Colombia increased to 18 Friday with the early morning recovery of two more bodies, a state government spokesman said. "Because of the explosion, it is considered very improbable" that they survived, Ortiz had said Thursday. "There's no hope of finding them alive," Dora Sanchez said on CNN affiliate Caracol TV. "We felt a very strong explosion," miner Edgar Herrera told Caracol. "It left us ... stunned, deaf." "There is immense pain," Uribe said at a news conference Friday, according to the website.